Until a few decades ago only a handful of people knew about the Wave in North Coyote Buttes of the Paria Canyon Wilderness on the border of Utah and Arizona. Today there is a lottery to determine who gets in. Phenomenon is the word. Nothing else does it justice. The undulating strata and spectrum of colors found in the sandstone walls of the Wave date back to the Great Pangean Desert of the Jurassic Period about 160-180 million years ago. Wind and water erosion carves, smooths, and reveals the layers of sand left here in great dunes and then compacted and mineralized (colors) into stone. 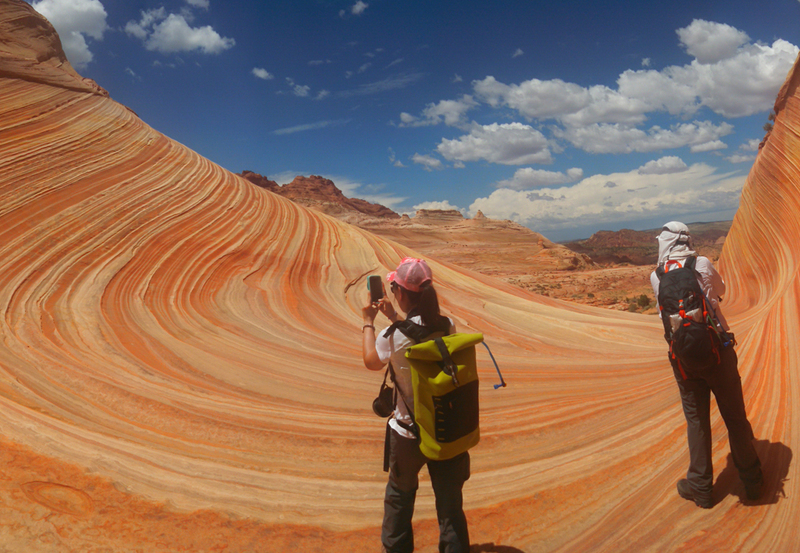 While the Wave is a smooth, polished bowl of striped wind-swept sandstone, the same exotic rock is displayed in numerous forms, shapes, colors, and patterns throughout the guided hike to the Wave in North Coyote Buttes. Get the most of your Wave experience! If you are lucky enough to get your paws on a permit to hike the 6-8 miles of Coyote Buttes North and the Wave, consider The Wave Tour guided by Dreamland Safari Tours. 2. Area Orientation, maps, and ideas for DIY adventures. 3. A homemade picnic lunch. 4. Knowledgeable tidbits about the geology, ecology, and history of the area. Guided Hiking through the easiest and most scenic routes to the neatest alternate and subtle Points of Interest including Dinosaur Tracks and bizarre colorful rock formations and hoodoos. 5. Guided photography and tips at dozens of locations. 6. Personal Safety- We help prepare you, keep you on track, and make sure you are safe in the Paria Canyon Wilderness. Our guides carry a Medical Certifications and satellite communications in case of emergency. Elevation change, uneven footing, and sand make the terrain on The Wave Tour more difficult and the distances are some of our longest at around 8 miles. Please be prepared for hiking in the sun in general. Daypacks are necessary especially in Summer when our guide alone cannot carry enough water for everyone to safely complete the hike. Boots are highly recommended. Please carefully consider your age and physical abilities especially during the hottest months of the year: June, July, August. This tour is especially difficult in the heat.